Force, Energy and Power Basics -- What is a Newton, a Joule and a Watt? Energy savings plan leads to disagreement over "Crime spike as lights are switched off in Eastbourne and Hastings"
Paris, France: The City of Light Has Chosen to Go Dark! See What's Lit, Not the Light. Saving energy also makes economic and political sense. The International Dark-Sky Association in Tucson, Arizona, an environmental group, estimates that one-third of all lighting in the U.S. is wasted, at an annual cost of about 30 million barrels of oil and 8.2 million tons of coal-a total of about U.S. $2 billion. That oil amounts to generating 14.1 million tons of CO2 per year into the atmosphere, which adds to the global warming problems and all the extra future expenses that will entail, all for light that we do not even fully use. What is all this light for anyway? Do people really enjoy living under a smoggish orange/copper haze every night? Do they understand the health problems this causes? Do people really consider this to be progress? these mercury and air pollution producing coal fired power plants are used to power this light pollution. Having dark skies alone is now a reason that people travel to destinations as tourists. New Zealand's Lake Tekapo community decided years ago to work to keep their skies dark to help out the nearby Mount John Observatory. Now it is being considered a World Heritage Site just for its skies! Check them out at http://www.tekapotourism.co.nz/activities/earth_and_sky.html! Leaving the lights on for no reason at all is not just sheer laziness and is an expense that New Your City seeks to eliminate. This opinion video piece covers how each and every light adds up to a large budget woe. Every light that is left on and every electronic device left running costs money. Money and energy that instead could be used to do something useful. A Lighting Cost Calculator - If you would like to calculate how much your lighting costs can be, you can try out this site at: Selene-NY.org. A variety of prices are defined for the New York area, however, you can put in your own cost per kilowatt-hour to better reflect your own usages. Not only do they calculate the cost of running your lightbulb for the year (including prices due to their burning out), they also add in a number of other calculations as well. 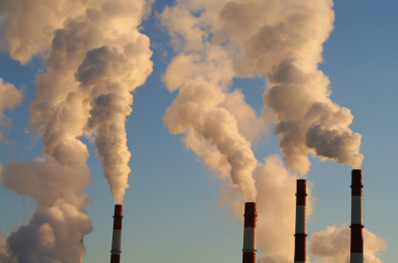 The site also calculates the amount of pollutants given off, the needed amount of coal to be consumed to support your light, the number of trees that would need to be planted to consume your CO2 production, and others that may open your eyes to the true expense of the different types of light sources. Many towns and cities are taking their own steps to reduce light pollution, such as the town of Ridgefield, CT. As reported in the Danbury News Times article, Ridgefield will reduce their lights around some school lots, at the old high school, and at their Parks and Recreation Center. Their savings are projected to be almost $7 thousand their 1st year. That savings is after the one-time $12,000 cost Northeast Utilities would charge the town for shutting off the unused poles. From then on, they'll save almost $19 thousand a year. The European Union is also phasing out incandescent light bulbs in their effort to cut energy waste. According to their www.europa.eu press release: EU citizens will save close to 40 TWh (roughly the electrical consumption of Romania, or of 11 million European households, or the equivalent of the yearly output of 10 power stations of 500 megawatts) and will lead to a reduction of about 15 million tons of CO2 emission per year. Forty Terawatt-hours is a lot of energy! Tera means trillion or 1012. It really is enough to make your head spin! But if you are like most people, then you may be thinking that 40 TWh sounds like a lot of something , but what that is they do not know. This is because many people do not know what a basic watt means. As a physicist, it seems absurd to me that people are willing to pay for their electric bills, when they do not know for what they are being billed at! It is like not knowing what a gallon of milk is, but buying one anyway, month after month. So, let's take a quick moment to find out just what is a watt. In order to understand what a watt is, you first need to know what a Newton and what a Joule is. To understand or get a feeling for these units of measure, I going to ask you to become a bit of an at-home physicist. Do not worry, this is simple and fun. To start this little at home exercise, you'll need 102 grams of mass. 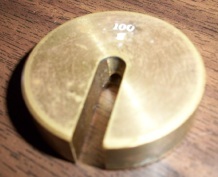 A 100 gram mass, like the kind used in a physics lab, is quite good, just tape a small paper clip to it if you would. However, if you don't have such a mass, well, then you can use $4.05 in spare change. Specifically, you'll need sixteen quarters and five pennies. (Yes, I did measure them out, and on average, this comes out quite well for what we need to do here.) Next, either combine the coins into a paper coin sleeve, like those that you get from a bank, or just tape them together. This combined mass should approximately come out to be about 102 grams, if you weigh it and if you find the result is too much then you can subtract a penny or two. The closer to 102 grams the better. Note that 102 grams is also 0.102 kilograms or just 0.102 kg, as a kg is 1000 grams. Next you'll need to measure a meter's length. You may have a meter stick. If not, you can use a tape measure with metric measurements on it. Or you can measure off 100 cm if you have a simple basic "foot length" ruler with metric measurements. Okay now, to quantify a Newton for you, first just hold and feel the weight of the 102 g mass. Now, according to Sir Isaac Newton, a force is a mass accelerator or F = ma. The average acceleration due to gravity on the Earth is 9.8 meters per seconds squared downward or 9.8 m / s² downward. Thus, the gravitational force on the mass you feel in your hand is almost the metric (specifically the SI or System International ) unit of measure of force called a Newton. Note that while it is rather small, it is still a force that human-sized , meaning that it is easily quantifiable for a human being to deal with. The "downward" description may seem obvious (after all things don't fall up! ), but it fulfils the vector definition of force and helps keep our thinking straight and clear when we get to energy. PE = - F • d. It is the definition's part of acting against a that is the reason why we needed to keep the vector directions clearly defined. If you want to define half a Joule, lift your mass half the height of the meter stick or use the same height but use half the mass. We know the energy is in the lifted mass, for if we drop the mass we know that it will make a loudish sound when it reaches bottom, it may bounce and it may roll about for a bit. The energy to do all of that came from you lifting up the mass and you got the energy from food you ate earlier. While force is a vector, meaning that it not only has a quantity but it also has a direction to the way it acts, energy does not. Energy is just a quantity (also known as a scalar ). That energy which is stored in the lifted mass could be potentially be used to do lots of things. Attach a string to it, throw the string over a pulley and you may lift other masses with it, or that string can be attached to an electric generator and that generator can give power to light a bulb. Your use of it is entirely up to you. A Joule is a small human-sized quantity of energy. Isn't the metric system neat, with something a simple as a 102 gram mass quantity and a meter stick, you can define something as esoteric as energy. 1 W = 1 J / s.
Thus, every time you turn on a 70 Watt light bulb, that bulb uses 70 Joules of electrical energy to give you the light that it does for each and every second that the lightbulb is on. Or instead of turning on the lightbulb, you could have used that energy to lift 70 of those 102 gram masses the height of a meter. 70 of those masses weighs 15.708 pounds in the now American-holdout system called the Imperial system. Lifting 15.7 pounds to the height of a meter over and over for each and every second that the 70 Watt lightbulb is on, will not only tire you or any other person out after a bit, but also give you a real appreciation of the energy that is involved in lighting a bulb. of electrical energy into radiant energy, both heat and light, and just about all of it unused. For it is highly unlikely that the light's owner will keep watch over what it is being illuminated all night long. A kilowatt-hour or kWh = (1 kilo = 1000) × (1 W = 1 J/s) × (1 hour = 3600 s) = 3.6 million Joules or 3.6 MJ! Thus, for every kWh of energy that you used for the last month, you could have lifted 3.6 million of your test masses the height of a meter. That converts to a 360,000 kilogram mass or 792,000 pounds, which is almost the weight of a Boeing 747 wide body commercial airliner! That's a lot of lifting! Also note that the 70 W light bulb will almost consume, on average, an entire kWh worth of energy each and every night it is on. Take another look at your electric bill. At what rate are you being billed for your electrical consumption? Do you now think that you are being unfairly billed or is the pennies per kWh that the rates typically are a good deal ? How many kilowatt-hours did you use for the last month and how much energy is that? Take a moment to carefully consider what you used all of that energy for. This is the reason that you have been asked to try to insulate your homes better, use more efficient bulbs, and reduce your energy usage for heating/cooling by adjusting your thermostats. Also consider installing a timer on your home water heater and it will pay for itself very quickly. Also, think of how many homes exist in America and then realize what a tremendous amount of energy we use during our daily lives. Add to that the number of streetlights, stadium or athletic field lights, uplights on buildings that the owners like to believe is so important, most of which no one is around to look at. Is all of that energy usage truly necessary? cost per night = kWh per night * ($0.09 per kWh), your own rate may vary from this residential rate. NOTE: their prices are subject to change. You should consult their latest pricing guides listed on their website. FPL deals with more light types, here I just chose those that FPL will newly install. They currently charge 2.718¢ / kWh for non-fuel charges. There are other costs as well, for the wood, concrete and fiberglass poles, and for the underground connecting wires. Now, imagine a city that has 10,000 HPS streetlights rated at 200W each. Such a city will consume, by according to FPL's rates 880 MWh per month or 10.56 GWh per year. By their rates, the city will be charged $101,600 per month and $1,219,200 per year. A MWh is a megawatt-hour or a thousand kilowatt-hours, while a "GWh" is a gigawatt-hour, which is a million kilowatt-hours. From a rough measurement I made of a picture, I found that the light projected directly upwards from a drop lens, cobrahead streetlight is about 24.4% of the total light that it emits. If so, then 24.4% of those 22,000 Lumens per light (or 53.68 million Lumens for our city) are wasted as uplight. The electrical cost for that wasted uplight is then $5,831.60 per month, or $69,979.20 per year of light that is never used, that interferes with our ability to see the stars, that interferes with the environment and that interrupts sleep and impacts our health. (That's your tax dollars at work!) 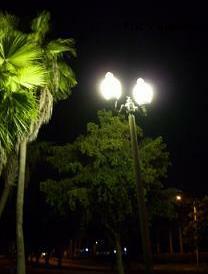 I'm certian that we have more than 100,000 streetlights in South Florida. Luckily, FPL states that it will replace damaged streetlights with shielded cutoff cobraheads. As all of its light is used in such shielded luminaires, less powerful bulbs are then needed. Hopefully, FPL will use the lower wattage bulbs in the replacement luminaires, too. Next, consider old fashioned incandescent bulbs. At most, only 10% of the energy they use generates light, the remaining 90% of the energy is needed to get the central tungsten coil hot enough to glow. In fact, a tungsten filament incandescent light bulb generates its light by using 90% of its electrical energy to first heat the filament to 3683 Kelvin / 3410°C / 6,170°F, in order to, as a byproduct, make light. This incandescent glow is also known as blackbody radiation. 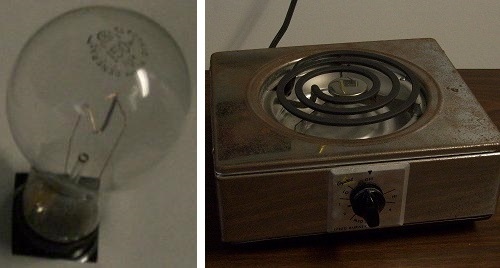 This is the same glow that comes from any metal that is hot enough to glow, such as electrical stove top burners seen below. Consider this when you light the interior of your house with incandescent bulbs in South Florida. For not only will you consume more energy and pay more in electrical costs just get the same illumination that other more efficient bulbs give, but then you will also then have to again pay more for the air conditioning costs needed to remove that generated heat from your home after lighting it with these incandescent bulbs. This is an indirect cost of such bulbs that is not calculated into their efficiency ratings. 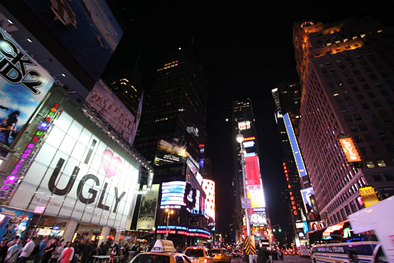 What is the total amount of lighting that is wasted in the U.S. alone? It is a hard question to answer because of various perceptions of what would count as wasted outdoor light . However, if we adopt the definition that waste outdoor lighting means those lights that are on where not needed or where no one is around to use them, on when they are not needed, or are directed upwards where no one can use them, then we can make some quick calculations. d - "These inputs combined result in a total annual electricity use of U.S. lighting of 700 TWh, or approximately 19 percent of total U.S. electricity use." f The Waste Outdoor Lighting $ shown here is based on an estimated 30 percent waste factor for all outdoor stationary light sources. 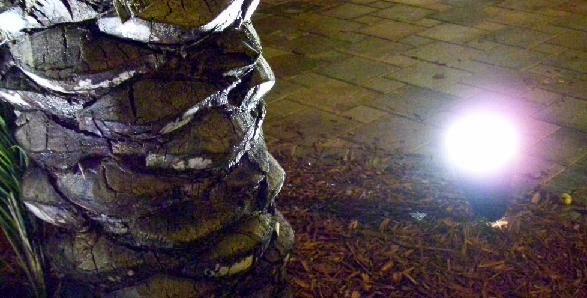 Waste Outdoor Lighting means lights on where not needed, when not needed, or direct uplight. The total wasted dollars per year for electricity does not include the additional cost for lamps, ballasts and maintenance associated with providing for and maintaining this waste lighting. Note: my calculated Consumption totalKWh/Year for the Lighting and the Outdoor Lighting values match with what the 2010 U.S. Lighting Market Characterization came up with, even though their numbers were derived by a different method. Summary: the total amount of wasted outdoor lighting is currently almost $3.5 billion dollars in electrical costs. Again, this does not take into account the additional cost for lamps, ballasts and maintenance associated with waste lighting. Oh, why do we do this? Now, as there is 36.6 kWh / gallon of gasoline, then this wasted lighting energy is equivalent to over 968 million gallons of gasoline or 3,664.28 million liters of gasoline (petrol) being launch off into outer space per year. Imagine the U.S. sending nearly 1 billion gallons of gasoline into outer space every year, for no real reason at all besides us just being not careful with our lighting. Wouldn't the public become concerned about such a practice? Wouldn't you prefer to use that energy for your own needs rather than wasted away never to be used again for no real identifiable reason? Doesn't the public realize that they pay more for their fuel bills because of this waste? Finally, all this wasted energy can be considered to be a toxic pollutant to the environment. This link to the LP vs. Plants page will make that very argument. - Quote attributed to Illinois Senator Everett Dirksen (1896-1969). Published: Wednesday, 30 January 2013 in theguardian.com. French light pollution law is expected to save 250,000 tonnes of C02 a year. Shops and offices throughout France will be forced to turn off their lights overnight in a bid to fight light pollution, the country's environment ministry has announced. Under the new law, which went into effect on 1 July, lights in shop window displays will be turned off at 1am. Interior lights in offices and other non-residential buildings will have to be switched off an hour after the last employee leaves. "I hoped the law would change attitudes in France and help the country become a pioneer in reducing light pollution." - Delphine Batho, French ecology minister. 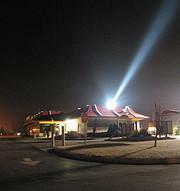 A McDonalds in Olathe, Kansas with a searchlight. 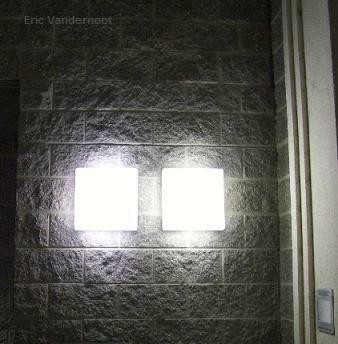 Shown to the left is an outward pointing "security light" at a corner of a commercial, strip-retail building. There are more lights at the corners and some in the middle. Why are the lights outward pointing? This is an example of wasted energy and dazzling glare which can hide a criminal. How many dark spaces do you see in the photo that a criminal could hide in? When installing lights, one needs to be careful of whether or not people can see only the light or what is being lit. Of course, no one light is the total source of the problem. However, each light not only directly contributes to this epidemic, but each light also gives permission , by means of example, for others to do the same. Hence, businesses or advertisers end up trying to out illuminate each other when trying to attract our attention. They forget that our reaction to their blaring is to shut them out and become ever more adept at ignoring them. People need tranquility every now and then before they completely shut themselves up like a clam. Does this give advertisers pause, no, for lighting is often installed for the sake of look-at-me advertising. However, in this media saturated world, does any business owner REALLY believe that using the next higher wattage bulb will ACTUALLY bring in more customers? Apparently, as seen in the image to the right, a McDonald's restaurant in Kansas does. The parking lot on the left exemplifies shielded lighting. Note how few lights are needed to illuminate the area and how it is done without glare. Next, the photo on the right shows lights shining into the sky and creating painful glare. Just what is the business owner trying to achieve with this overly-lit lot -- blinded customers?? There are so many poorly aimed lights being used that they almost seem to be trying to out-compete each other rather than illuminate the lot. Which lot do you think people will feel is more comfortable, more welcoming, and less oppressive to drive into? Other examples are linked here. 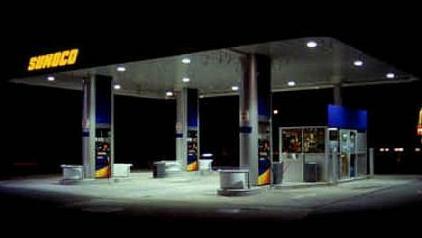 In the following study, researchers from the Lighting Research Center at Rensselaer Polytechnic Institute considered that last question, when they used a gas station to learn that by reducing the glare caused by the lights that illuminate the gas pumps, the station's business increased. For a customer, glare light can truly be oppressive and un-welcoming, as the study demonstrates. Source: Lighting Research Center, Rensselaer Polytechnic Institute, Troy, NY. The authors evaluated the lighting under a Springfield, MA gas station canopy, owned by F. L. Roberts and Company, Inc., using three luminaire types. All three types had the same energy consumption. They considered photometric conditions, energy efficiency, the tendency of drivers to turn into the station, patron opinions, the opinions of a panel of community leaders, and gasoline sales. The evaluation was carried out between April 12 and May 11, 2001. I. The original installation used drop-lens in a non-cutoff luminaire. This produced lower illuminances under the canopy. As this widely used luminaire was advertised, it produced a lot of external glare making the lamp is visible from far away, for providing better long-range visibility . But what good is better visibility if it seems to drive away customers? This configuration is a perfect example of a bad use of lighting. 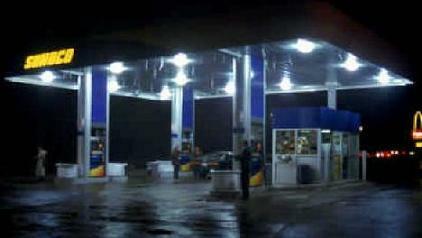 For here, you can more easily see the lights under the canopy, than what is being lit, namely the gas pumps. Just what are they trying to advertize or sell here? II. 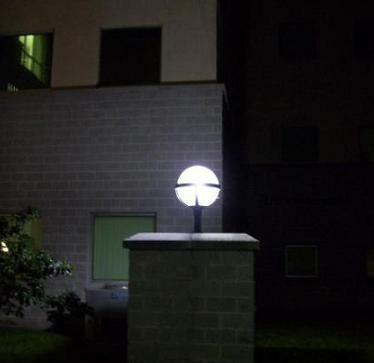 The second installation used flat-lens in a full-cutoff luminaire. Admittedly, this installation would be most preferable to astronomers and environmentalists, for it contains or focusses its light under the canopy better than the other setups. However, for customers, this setup created more shadows, probably down on people's faces from the directly overhead lights. III. The last installation used a prismatic glass drop-lens in a cutoff luminaire. This setup helped to eliminate more shadows under the canopy. The drop-lens extended 2.5 in. below the canopy. While they did produce more measureable glare, the amount was tolerable and the lamps were not visible from far away. A panel of community leaders regarded visual amenity when comparing several gas stations. 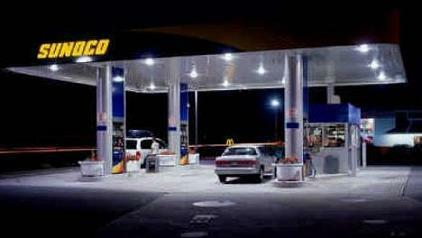 They gave the lowest rating of acceptance (at a different gas station) for the drop-lens, non-cutoff luminaire, similar to the original installation, and the highest level of acceptance for the drop-lens, cutoff lighting, as seen in this last installation. Image Credits: the Lighting Research Center of Rensselaer Polytechnic Institute. Better Sales: In opinion surveys, patrons noted little difference between the three lighting installations. However, the percentage of drivers turning in to the station and the mean number of gallons of gasoline sold daily increased immediately following the change of lighting from the original drop-lens, non-cutoff luminaires to the flat-lens, full-cutoff luminaires. The percentage changed again when the flat-lens were changed to the drop-lens, cutoff luminaires. These changes in drivers' behavior suggest that better directed lighting encourages drivers to use a gas station, but a more comprehensive study should be conducted to validate these findings. The next table showed the L.R.C. 's findings regarding this aspect. For the given time durations, it records the number of vehicles that passed the station, the number of vehicles that turned into the gas station, and the resulting percentage of the total number passing and turning in. Glaring lights can generate negative, oppressed feelings in people. Why would any owner of a gas station or any other business venture want their business to be associated with such feelings? People are not moths. They are not mindlessly drawn to light just because it's there. Don't treat them as such. This begs the question of whether or not all of our energy usage in America is really necessary. The Department of Energy figures that the outdoor lighting fixtures account for only 8% of the electricity used for lighting in the U.S. This amounts to 72,000 gigawatts-hours every year! And 93% of that is used to illuminate asphalt, namely streets and parking lots. However, there are ever increasingly questionable uses of lighting. For example, what follows are some pictures that show some of the ridiculous, questionable and useless usages of lights around our community. I am trying to show these images to get people to ask themselves whether they even need a light in the first place and to critically examine the result. 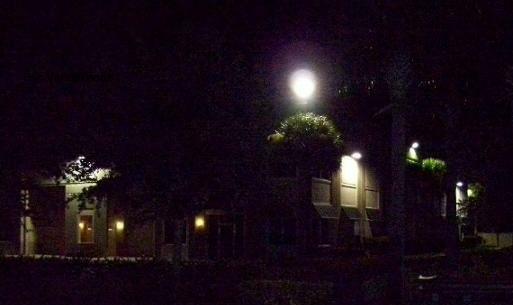 Shown to the left is an Acorn streetlight with no shielding to its top. Note how it wastefully illuminates the nearby trees branches, but poorly illuminates the area below the light. Is that what the city planners intended? To spend about $500 to $2000 per lamppost and luminaire alone just to illuminate nearby tree branches? Had the city planners decided to choose a light with even some reflective shielding top to it (an additional one time cost that ranges only from $60 to 80 depending on the vendor), then they could have easily used a smaller wattage bulb and used less energy overall. Instead they have chosen scores of these lights that intentionally throws tax dollars away literally up into the night. Every second these lights are on, hour after hour, night after night, year after year, for each and every light, tax dollars are being wasted for their either ignorant or vain display of excess. Next are some ornamental lights that predominately illuminate a wall. Perhaps it does make the bricks look spectacular , but at what expense and purpose? It has become common practice to below-light a tree or other vegetation with an up pointing light. This tree and others are in a showcase location and all have had the same treatment. However, it is past 1 a.m. on a Saturday morning. There is no one else about. There's not even a stray car passes by for ten minutes. Why are these trees lit, consuming energy resources and money, when no one comes around to see them? At this time of night, just for whom are these trees being showcased? On top of that, there is a possibility that the light itself is damaging to the tree's photoperiodism. This is about the tree adjusting its biological processes, such as its flowering, dormancy, root and general growth, in reaction to the lengths to the day's light. A tree that is not in phase, artificially or not, with its environment, will suffer. The purpose of these lights is rather ridiculous. 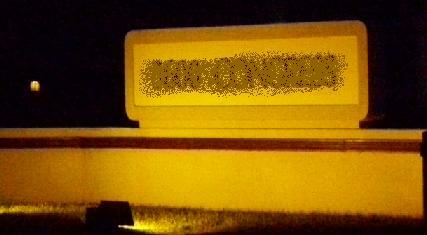 (I intentionally blurred out the actual address.) Here is a cement marquee that only says the address of the commercial building. It does not even advertise anything. The businesses here are open from 9 a.m. to 5 p.m., hours of which occur fully in the daylight and so there is no need for this sign to be lit then. Outside those hours, the sign is lit, but the businesses are not open. So anyone who needs the information to be lit up on the sign, must be there only when they literally have no business being there as the businesses are closed! I can assure the owner of the building that they would save more money turning off this light, than whatever additional rent they receive because the light is on. And yet the sign is lit because . . . ? ? To the left is the view from the parking lot of a local store and its quote-lit-unquote flag on the pole, shown in the upper left side. It is so poorly effective, the flag is hardly noticeable. To the store's credit, the parking lot is unlit. However, at what point does someone look up and question whether it makes sense to use a 1,000 watt light to barely illuminate a distant flag? 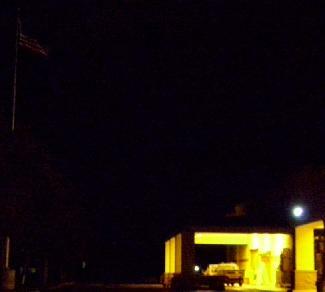 One could use a smaller 50 watt light on the top of the flagpole to easily illuminate the flag just below the lamp! Such a light points downward away from the sky, uses less energy, saves money in the long run, reduces light pollution and more effectively shows off the flag, which is the point of the light in the first place. A list of vendors that offer such intelligent solutions can be found on our Prevent Light Pollution page. YouTube has a video of Canary Wharf of London, England and it is rather mesmerizing. However, note how the scene seems to look like it belongs on an alien planet as night falls . Why would one choose to live under such a sickly, looking sky? 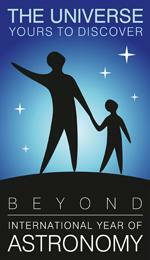 Would we realize what we are doing when our children choose only orange-brown colors to represent the night sky?